Made by Delano Studios expressly for S.P. Skinner Co. (Which is or was a nice home furnishings store). 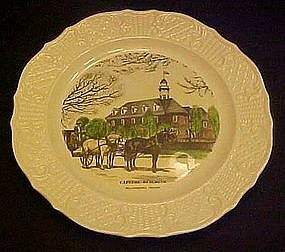 This great plate has historical Williamsburg's Capitol Building, as the center. Measures 10 1/8" in diameter and is in pristine condition. I will be listing more of these with different historical homes and buildings. Not sure when these were made.